Geometric looks with large areas of plain color and sharp edges are the new craze these days. Our 9 animals in vexel-like design fit into that modern way of painting perfectly. But instead of being limited to a certain resolution, our Geometric Animals come as pure vector files. Scale them to your needed size. 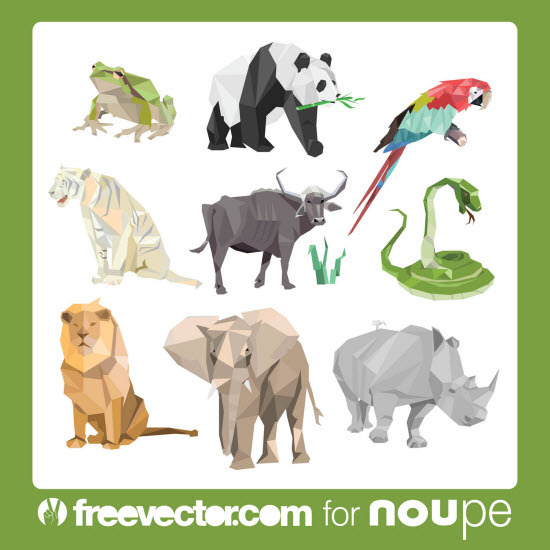 Our download package contains Geometric Animals as separate PNGs in high resolution. Besides that, you also get the vector files in the formats Adobe Illustrator (.ai), scalable vector graphics (.svg) and Illustrator PDF. Our set of 22 more conventional jungle elements contains some more animals, and – more importantly – plants to create that jungle feeling. 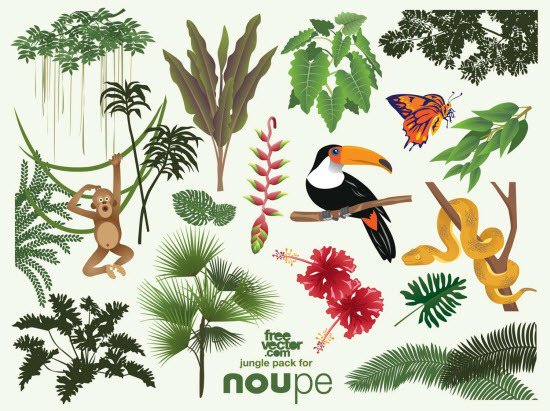 Other than the Geometric Animals, our jungle elements sport a more conventional look. The package contains files in the formats already mentioned, as there were Adobe Illustrator (.ai), scalable vector graphics (.svg) and Illustrator PDF. Separate PNGs in high resolution are also part of the download. The whole package comes in the form of a zip archive and weighs in at 16 mb. You are allowed to use the freebies freely, for commercial and private projects alike. There’s two things you are not allowed to do, though. You will not redistribute them as a download package. And you will not make believe that you were the creator. After having secured that download package, make sure to visit freevector.com. Freevector.com describes itself as "your ultimate source for free vector art, clipart, vector logos, illustrations & vector wallpaper graphics for your print projects or website". I started using freevector.com a few months ago and have always succeeded in finding the exact file I needed for a certain project.